Mohamed Mursi has a direct link and responsibility for all terror attacks which are taking place in Egypt since 30/6/2013 and also a direct responsibility in creating a climate of violence. 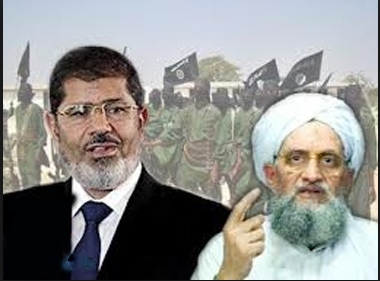 Many of the terrorists and thugs elements committed terror attacks after 30/6/2013, were among Morsi’s presidential pardon list and were given a presidential pardon by Mohamed Mursi when he was in power. Mohamed Mursi gave a presidential pardon to more than 810 dangerous terrorist and criminal elements. Mohamed Morsi hijacked legislative and executive powers and authorities, and gave himself immunity against any questioning. Mursi’s authorities were actually blatant violations and above the law and the constitution. The law states that any presidential resolution is effective from the publication date in the official newspaper. The official newspaper is published weekly every Thursday. The presidential pardon resolutions were published in the official newspaper in special editions, instead of the weekly edition, this was another violation to the law. Mursi violated the law when he gave presidential pardon to fugitives elements of law provisions. The law prohibits any presidential pardon for a condemned or accused convict fugitive of law provisions. Mursi issued some of the presidential pardon resolutions without any reason or national or a religious occasion that requires any presidential pardon. Mohamed Morsi included in his presidential pardon many criminals and terrorists who were under investigation by the General district attorney office. The law prohibits presidential pardon to defendants under investigation. Mursi violated the law, because the law doesn’t allow presidential pardon to drug dealers, terrorists, assassins or espionage. I’m dedicating this post to all International human rights organizations and the foreign press who claim that Mohamed Mursi’s trials are framed and revenge launched by the Egyptian government. This is a physical evidence. This is the direct link of Mohamed Mursi to terror acts happening in Egypt. I want the human rights organizations and the lawyers who defend Mohamed Mursi and claim that he is innocent, to forget about all his others crimes, and read this one, and count to me how many crimes and law violations did Mohamed Mursi commit per this presidential pardon, if they have the courage and the honesty to declare it! Can Obama’s administration or any authority in the United States issue a general pardon or presidential pardon to terrorists and assassins or drug dealers?! Obama said many times “Yes we can”, I don’t think he can say Yes we can to this one!!! But, no matter what we say or present of evidences to make the world see the ugly truth of Muslim Brotherhood, the world is deliberately living in a total denial status and I wonder why!!!??? A list of presidential pardon resolutions included convicted dangerous terrorists, criminals, drugs dealers , traders smuggled unlicensed weapons and ammunition, swindlers, forgers, corrupted elements practiced public and private money theft, money laundry, assassins of late President Sadat, assassins of famous Egyptian writers and human rights activists…etc, released from jail and pardoned by Mohammad Morsi. Morsi pardoned prisoners on the occasion of the holy month of Ramadan, July 19, 2012, after only 19 days of taking office on June 30 of the same year. The pardon included 588 prisoners , including Palestinians were accused in a number of cases, most notably the arms and ammunition, weapons theft, including 487 accused of possessing and making firearm, and 29 accused of possessing white weapons. 16 accused of the trade of weapons and ammunition, and 17 accused in robbery cases, and 10 accused of acts of terror and violence, and 5 accused of sabotage and deliberate destruction, and 24 defendants in a variety of crimes, including drug trafficking. The presidential resolution also included an exemption from the original sentence, or what remains of it. Mursi’s pardon covered also the original sentence for 49 prisoners, unless they were sentenced of other issues. Ahmed Ragab Mahmoud Shlob , Palestinian nationality, was accused of drug trafficking, and a member in active cell in the smuggling of weapons into Sinai during the month of June 2011. The original sentence reduced from sentence for life in prison to seven years. Yasser Ibrahim Khalil Abuchaouih, reduced from life sentence to 6 years. Khalid Ibrahim Khalil, the same duration, reduced from life sentence to 6 years. Ahmed Samir Mohamed Afifi sentenced for life reduced to 4 years. Shehdeh Mabrouk and Mohammad Yousuf reduced from life sentence to 3 years. Nabil Alsayed Zaky Mohamed, Ahmed Nageh Alsayed Zaky, Salah Gab Allah Salem Hassan, Islam Reda Hussein Alsayed. Each had one year reduced sentence, from sentence to life prison. Alahmady Almorsi Abd Elsalam Ahmed, Hany Hussein Suleiman, Mostafa Kamel Tawfeek Gomaa, Had 7 years reduced from life sentence. Mostafa Abd Elal Abd Elrahman Aly had 2 years reduced from life sentence. Ayman Mahmoud Sayed Mohamed, Moftah Farag Saiid Kobs had 3 years reduced from life sentence. All 26 belonged to Muslim Brotherhood International Organization, accused of national security threats, assassinated police officers, terror acts and terrorizing the society. The original sentence was life prison and death sentences for some. Names among convicted: Gharib Alshahat Ahmed Gohary – Hassan Alkhalifa Ossman Aly – Ahmed Abd ELjader Bakry Mohamed. Mahmod Abd Elghany Abd Elhafez accused in forgery, illegal weapons and ammunition possession and assassinations and a member in terrorist group ( original sentence, life sentence). Abu Elela Mohamed Abd Rabo had two sentences: life sentence and 20 years prison. Alsayed Saber Khatab charged of murder in the violent event of Iman Mosque in Suez City and had 15 years in prison. Ahmed Mahmoud Hamam, accused of participated in the failed attempt of assassination Mubarak and had life sentence. Attia Abd Elsamie Mahmoud also participated in the violent event of Iman Mosque in Suez City and he had life sentence. Atef Mussa Saiid, participated in failed attempt of assassination Mubarak and had life sentence. Shawky Salama Mustafa Attia, charged in the case of “the returnees from Albania”. Had sentence for life. Mohamed Mohamed Hassan participated in criminal acts and incitements for crimes and had 3 years in prison. Mohamed Yussry Yassin, violated the implementation of constitution provisions and charged of bombings Alazhar area in year 2000, had 10 years in jail. Hussein Fayed Taha, charged of theft, killing crimes and had life sentence. Shehta fawzy abu treka, charged of forging governmental official stamps and theft of 7 million Egyptian pounds from the ministry of interior account, and accused of fraud. Had 10 years in prison. Abd Elhamid Ossman Mussa Omran, nick name “: Ossman Abu Akrab”, charged of killing crime and had life sentence and he was also condemned before of killing Sherin Fahmy police general in Assiut city security and others also were accused with Abu Akrab of weapons and ammunition theft from the Assiut security directorate. Alsayed Abu Alnaga Alsaftawy violated the implementation of constitution provisions and had 15 years in prison. Mohamed Mohamed Ismail Khalil accused of joining a banned group, and the attempt of assassination of Mubarak, and was sentenced to 15 years in prison. Ashraf Mohammed Abdel Halim, accused of joining a secret terror organization and committed terror acts, he had two sentences, sentence for life and sentence to death. Famous preacher Wagdy Abdel Hamid Mohamed Ghoneim, was deported from Bahrain in 2008 for security reasons and was forced to leave England and prevented from entering UK on charges of incitement to terrorism. Awad Mohamed Saad Al Qarni, Saudi famous Preacher sentenced to prison in money laundry and the financing of terrorist group with the volume of money four million British sterling and 2 million and 800 Euros. Ibrahim Munir Ahmed Mustafa a Muslim brotherhood international organization member and the Secretary General of the International Organization of the Muslim Brotherhood, and a spokesman for the Muslim Brotherhood in Europe. Sentenced for 10 years in the case of the revival of the organization of the Muslim Brotherhood in 1965, he lives in London. Aly Ghalib Mahmoud Himmat, one of the leaders of the Muslim Brotherhood in Syria, and Youssef Mustafa Nada His famous nick name Youssef Nada, former commissioner for international relations of Brotherhood Organization, he is also known of “the Brotherhood’s bank” accused in the assassination attempt of Late President Gamal Abdel Nasser, in mansheya in Alexandria in 1954, and accused of supporting terrorism in 2001, and was sentenced for to 10 years imprisonment. Shaaban Aly Abd Elghani Hareedy had death sentence and the sentence was replaced to serve 15 years in prison, in the case of the attack on a bank in Ayat in Giza, and the murder of a police officer. Morsi pardoned 57 convicted of sabotage and disruption of transportation and theft and drugs, forgery, fraud. Corruption, damaging public and private properties. Mursi issued this resolution without any reason or national or a religious occasion that requires any presidential pardon! The pardon included 41 prisoners who were pardoned on the original sentence, or what remains of it, and 11 people were pardoned on the original sentence, or what remains of it. One convicted was pardoned from punishment’s subordination, his name is Khairy Adel Khairy, and he had general pardon while he was sentenced to nine months on charges of drug possession. While 4 Others convicted with the same charge of drugs possession had the 9 month in prison reduced sentence. Ahmed El-Said Elsayed Fadl sentenced to 5 years and 6 months in infringement case. Ahmad Ramadan Mohammed sentenced to 6 months in the case of possession of weapon without a license and Ahmed Lotfy Abdullatif 3 years imprisonment possession of drugs, and Abdel Tawab Mohammed charged of theft and imprisonment of 6 years and 6 months. Imad Sobhy Jaballah use of force , 5 years in prison. Fatah Mohammed Ahmed charged of use of force sentenced 6 years in prison. Karem Abdel Tawab sentenced 10 years in prison possession of weapon without license. Michael Nady Leto charged of theft and had 7 years prison. Mohammed Abdel-Fattah Ismail charged of sabotage 6 months in prison. Mahmoud Salem Abdullah was convicted of possessing a weapon without a license – Mustafa Darwish Muhammad convicted of attempted theft 3 years in prison. Wael Nabil Suleiman sentenced to two years in prison charged of sabotage and his brother Osama is also accused of destroying movables private properties and sentenced to 7 years in prison and his brother Mohammed also sentenced for the same charge and was sentenced to 3 years prison. Taha Mohamed Abdel Hadi been sentenced to 5 years in theft case – Hassan Ramadan 10 years in prison for possession of weapon without a license. Mustafa Ahmed accused in theft case and was still under investigation but he got full presidential pardon – Sameh Mandour sentenced to 3 years in prison in possession of a weapon without a license – Mekky Mohammed Saleh charged in the case of drug trade had 3 years in prison. Shoaib Muhammad was sentenced to 5 years in prison on charges of making explosives. Ahmad Muhammad Matari was sentenced to one year prison on charges of sabotage. Mohammed Ahmed Mohamed Metwally has been sentenced to six months imprisonment in a case of sabotage. Mohamed Samir Kamel one year in prison for sabotage – Mohamed Ahmed Mohamed 6 month in prison sabotage. Wessal Mohamed one year, sabotage – Youssry Hussein Shehata, 6 month sabotage – Fathy Mohamed same charge. Abdel Tawab, possession of weapon without license, two years. Alaa Hussein Abdullah possession of weapon without license, two years. Tariq Rabie Arafa, damaging public transportation 7 years – Imad Ramadan Rashid, disrupt transportation 3 years – Walid Ramadan Rashid, disrupt transportation 3 years – Gamal Islam disrupt transportation 5 years – Adham Ramadan disrupt transportation 5 years – Hedayat Nasser Mahmoud, disrupt transportation 7 years – Nabil and Alaa Mahmoud disrupt transportation 10 years. Mahmoud Mohammadi Igaza, damaging private properties 5 years – Adel Saad Mahmoud possession of weapon without license was under investigation and got presidential pardon. Salim and Suleiman Suleiman possession of weapon without license 5 years – Fayez Mahmoud Muslim possession of weapon without licence 3 years – Mustafa Mohammed Khedr forgery 5 years – Ahmed Fathi Abd Elkhaleq libel and defamation 3 years. Amr Ahmed El-Shahat, possession of weapon without license 3 years. Mohammed Farhat entering a military zone, one year. Mahmoud Mohamed Yousry, possession of weapon without license 3 years. Nimr and Mohamed Eid, theft 3 years. Hisham Mohammed Hawari, theft, and was under investigation and got presidential pardon. Romany Bushra Farhood theft and corruption 3 years – Salah Shihab-Eldin, explosives possession 7 years – Issam Rajab Abdel Al, possession of explosives 3 years – Malek Abuahamd Radwan possession of weapons without licence 3 years – Gad Elrab Abdulkadir Mohamed Gad, theft 5 years – Mohammed Hassan, pitching one year. 16/7/2012, during Morsi’s visit to Ethiopia accompanied by the journalist of Alwatan news Shaimai Adel, she was held in Sudan for two weeks. Morsi declared that he settled the issue with Omar Bashir and released the journalist. After a short period, the two presidential decrees were issued by Mohamed Mursi to release 123 Sudanese who were charged of: money laundry, forgery and theft, possession of weapons and ammunition and smuggling weapons through the borders and illegal immigration. Morsi ignored the serious charges against these Sudanese and released them. Morsi received Omar Bashir in the presidential palace and Bashir left with 123 Sudanese criminals back to Sudan! 6 – Resolution No. 157 of 2012, issued on September 3, 2012, and published in Issue 35 bis (c) of the Official Newspaper issued on the same day. 7 – Resolution No. 36 of 2013, issued on January 26, 2013, published in Issue 4 continued, issued official newspaper on the same day. Mursi gave Egyptian identities to more than 3000 Palestinians. This is another violation to the Arab League resolution issued on 1959 approved and signed by Egypt, not to give a different nationality to Palestinians to maintain the Palestinian identity in order to guarantee their right in returning to their homeland.